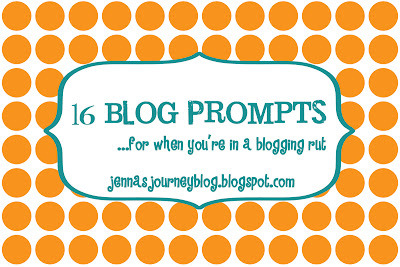 Jenna Blogs: 16 Blog prompts for when you're stuck! That's happens to everyone at one point or another. One thing I haven't seen on a mom blog is a post with blogging prompts. When you google "blog prompts" you can find a lot of information but they never come from this type of a blog, so I thought I'd write down a few prompts. If you find yourself stuck, maybe you can give one of these a try! 1. Something I always like seeing posted is a favorite family recipe, with pictures. If you don't have pictures, I'm less likely to check it out! 2. A day in the life of post. It's nice to be able to look back on your past routines! 3. A holiday or seasonal decorations post. I can't tell you what a lifesaver it's been for me to be able to see how I decorated my mantle for past Christmases! It takes some of the guesswork out of things! 4. An iPhone (or other phone) picture post. Sometimes we take the most interesting pictures with our cell phones, and this is a fun way to recap some of the things you've seen and done. 6. Pass on the blog love and do a post about your favorite blogs. Who do you love to read about? Is there someone who inspires you? Makes you laugh? Always has fresh content? 7. Do you have people reading your blog from all over the world? Why not show them a bit about your neck of the woods? Post a little bit about where you live, the culture, things to do in your area, why you like living there (hopefully) etc. 8. Books, books and more books. I would guess that most bloggers enjoy reading...since they are writing a blog and more often than not, reading other blogs. So share a list of your favorite recent reads, or lifelong favorites! 9. Do you watch a TV show that a lot of other people watch? Start a discussion about it via blog post! 10. Number 10 for this list is appropriately called "10 things you don't know about me". I've got a couple of examples of these, here and here. 11. Do you know how to do something that you think other bloggers would be interested in learning? I've done posts on watermarking your photographs, a basic tutorial on Pinterest, a how to use Swagbucks post and a guide to Picnik and picture collages. Share your knowledge! 12. Have you seen some crazy stuff out there? I know I have. Maybe it's on Pinterest or stuff you've seen in magazines. Share it and make someone laugh! I did this post on some crazy baby products! 13. Have a favorite product that you use all the time? What do you love about it? Share it! 14. Do you shop online? Where do you find a great deal? 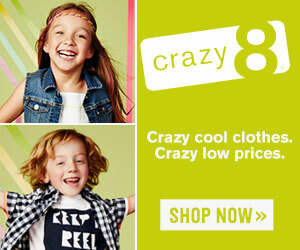 We all like to save and find new, interesting sites to shop at! 15. As a mom blogger, one thing I get emailed about on a consistent basis are baby products. What do I love, what do I hate, what's useful, what do you think will be useful but then really isn't, etc. I did a post sharing my favorite things for baby and I know several other moms have too. It's great to be able to search out helpful lists for new moms! 16. Forget blogging. No, seriously. Do a VLOG! Need some inspiration? Check out this blog! I hope these will help you out the next time you find yourself in a blogging rut!